Well, how time flies, it’s almost 12 months since our last blog post due entirely to the fact that we’ve been so busy. In 2018, by the time we all sit down to enjoy our well earned Christmas dinner, we will have performd or assisted at almost 30 events! Our Calendar of events for November and December 2018 has now been published and we’re looking at a really busy few weeks ahead of us. Wish us luck and we hope to see you! It’s beginning to….sound a lot like Christmas! It’s that time of year again and after a busy Summer we’ve got a full programme of events planned for November-December 2017. We’re pleased this year to be performing in the new Ikea Store in Sheffield, as well as Meadwhall, Tesco stores in Rotherham and Maltby and Crystal Peaks near Sainsburys and the Market Place. As such our rehearsals are in full swing and we’ve been singing Christmas carols since September! We hope you can make it to one of our fundraising events, your suppport really does mean a lot to us and we have to thank everyone that has offered to help with this year’s fundraising campaign. 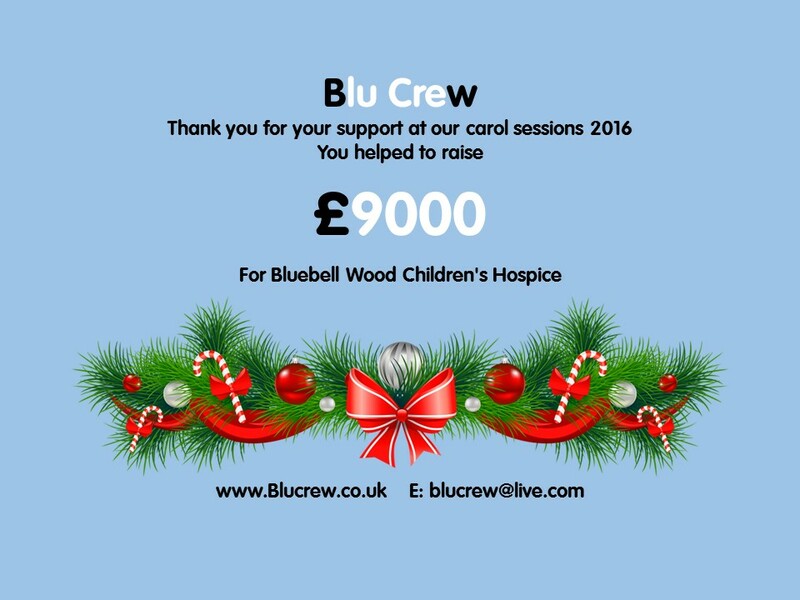 Well, the carol sessions are over and the counting elves have done their thing and we are thrilled to announce that this year we were able to donate £9000 to the Hospice. To say we are pleased is an understatement….here’s to a fantastic 2017! Well, what an incredibly busy Christmas season we have planned. 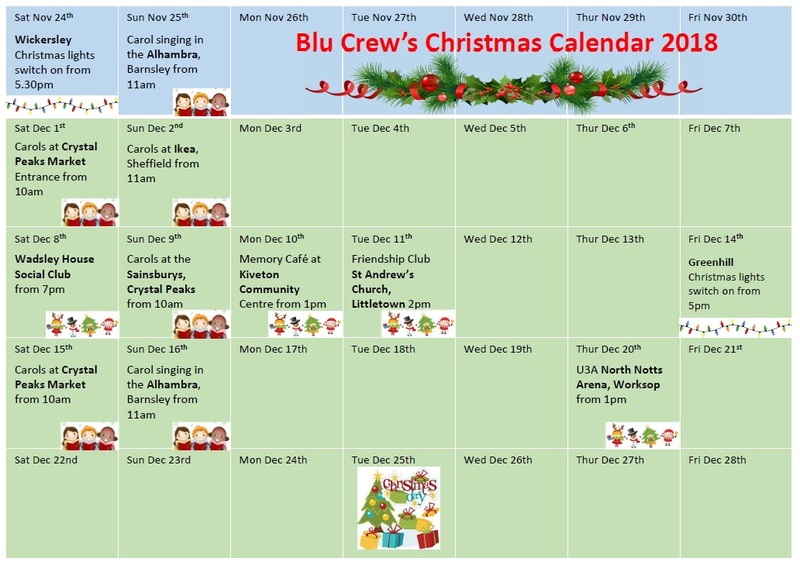 To date we have booked nine carol singing sessions throughout the region, kicking off on Saturday 26th November 2016 and ending on Sunday 18th December. At this stage we don’t yet know exacty where we will be in Meadowhall, so watch this space as they say. But we can confirm that you will find us outside the entrance to Sainsburys on Crystal Peaks, in the entrance foyer at Morrisons in Worksop and in store at Tesco Extra in Rotherham. This is by far our busiest time and as we are all volunteers with ‘day jobs’ it really does take a lot of planning and commitment so we’d be very grateful if you’d come along to one (or two or even all nine) events and show us your support…it’s so much more fun if we have someone to interact with. As you may know our founder Chair, Nigel Solway, is emigrating to Tenerife to enjoy his retirement in warmer climes. His departure set about a re-structuring within the group as we elected new officials and distributed the technical roles around the Crew. We always knew what a valuable team member Nigel was and how much effort he put into the group. A few other members have also now left the group for a variety of reasons and so we thought we would thank them all for their hard work and commitment over the years, it really has been appreciated. Since we formed in 2009 we have collectively helped to raise in excess of £100,000.00 for the Hospice alone. So here’s a very big THANK YOU! to all Crew members, past and present. 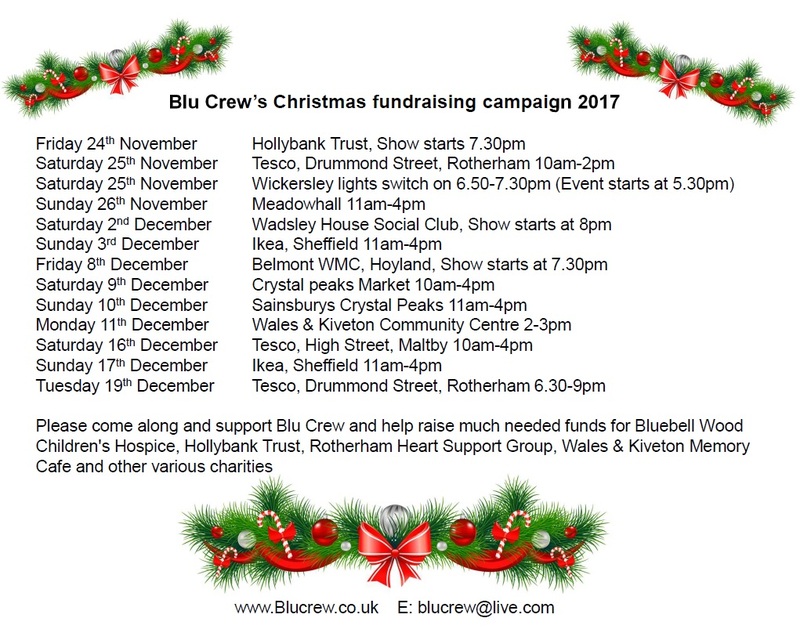 As we move forward and look to the future we’re very happy that we have 8 carol singing sessions booked in at Meadowhall, Sainsburys at Crystal Peaks and Tesco at Rotherham to support Bluebell Wood Children’s Hospice. We are a much smaller group now but the remaining members have a passion for entertaining and fundraising and although we’re having a quiet year event wise we’re looking forward to the future and hope that we can count on your continued support. Bluebell Wood Children’s Hospice care for children and young adults with life-shortening and life-threatening conditions. They are currently supporting around 250 families, both in the hospice and in family homes. Their support services are wide ranging and bespoke to each family; including end of life treatment and care, music therapy, counselling, sibling support groups, home visits and much, much more. Due to their expanding services their costs have gradually risen to more than £4m, enabling them to support their families in the best possible way. They continue to receive around 10% government funding. 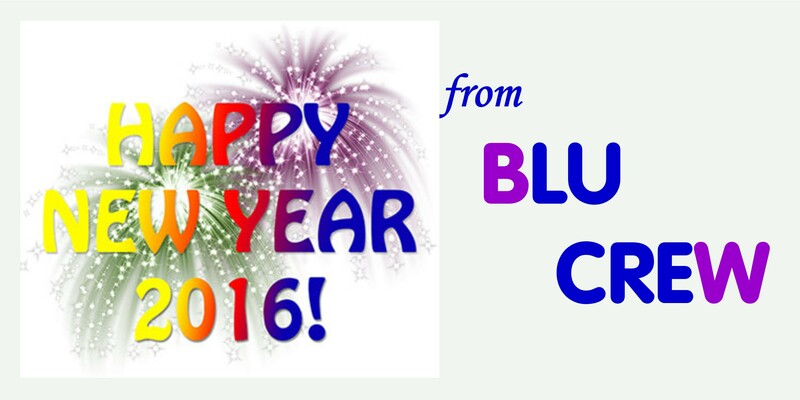 After a successful 2015 we’ve already started planning our events for 2016. More details will follow as planning progresses. Watch this space! 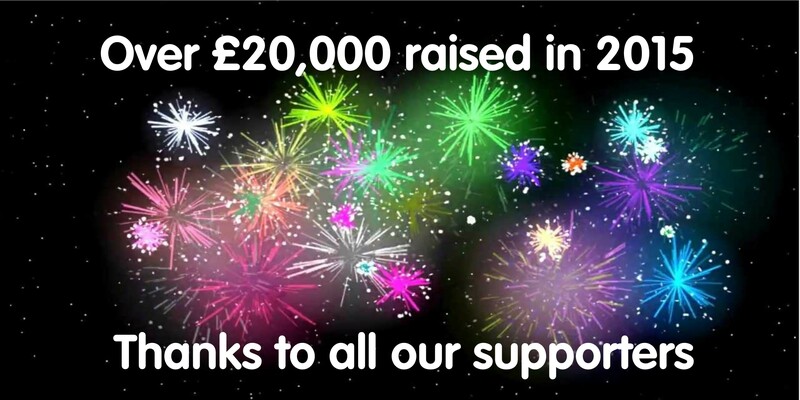 It is with great pride that we announce that our fundraising efforts for 2015 have topped £20,000. We can’t begin to tell you how pleased we all are and of course we simply couldn’t achieve such an amazing result without the help and support of so many people and their families. We’re all having a well earned break now and are looking forward to a very Merry Christmas and a Happy New Year and we wish the same for you. First time Volunteer, Molly Hardy, shares her experience. “Hi, my name is Molly and I am 14 years old. I spend my time doing my coursework for school and spending my time with family. I spend every weekend at my Nan’s. I love to help people in any way possible, just to see the smile on their faces. I adore dogs. I have two dogs, Gizmo and Buster. I couldn’t imagine life without them. When asked: what did you enjoy most about the event? “Seeing people joining in a dancing with their little kids and seeing how generous people are. Hearing people say how good Blu Crew were singing and saying how much they enjoyed it made it even more special. Knowing where all the money was going made you feel even more grateful for how kind people still are. They were saying how good they were singing and saying it made their day just seeing them. I spoke to a women and she said it was her last Christmas, which broke my heart into a thousand pieces, but made me realise what this money can do and what people/kids are going through day to day. Some said “You all deserve the best Christmas for doing this from the kindness from your hearts.” One person said “This is better then what you find on The X Factor” which made me giggle a little. Molly really enjoyed her time with Blu crew and has said that she would be willing to help us at future events; we are really grateful for her help and look forward to seeing her again soon.